Welcome to Motomotion In South Woodham Ferrers, Essex. 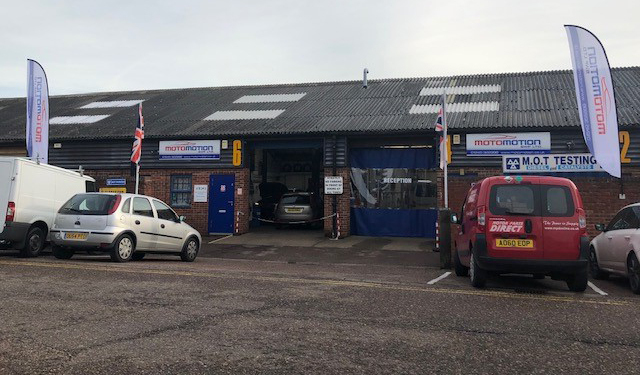 We are one of the longest standing car garage and repair centres; not only in South Woodham Ferrers but also the Chelmsford area. We began back in 1979 when there was no such thing as an ECU to alert you to the problems of your car. Therefore; we have learnt our trade the old-fashioned way. We understand the inner workings of almost every make and model of vehicle. We pride ourselves as the leading MOT test centre in South Woodham Ferrers and all-round car repair centre, with very competitive prices. Regardless of make, model, age and transmission of your vehicle, we have the team to get you back on the road quickly and efficiently, without unnecessary costs. We make one guarantee when you visit us at Motomotion. You will never be charged main dealer prices but you will receive main dealer quality. We assure you of fair pricing and our customer service is second to none. Anything from a minor repair, new tyres, an annual service or your dreaded MOT, look no further than our dedicated team. Serving South Woodham Ferrers and the surrounding area since 1979, our reputation precedes itself. Feel free to call in the garage and our friendly dedicated team will be happy to help you. You are also able to reach us on our Facebook page and through our Website.